Last minute cancellation is not refunded, however ticket is transferable so you can give it to someone else. I will do my best to run all scheduled classes. Workshops must have a minimum of 5 participants. In the event that a class is cancelled, students will be notified via email and entitled to a full refund or credit. Photos are allowed to be taken by participants but no video is allowed. ​..."Though I have been painting for number of years I did not have a clear & exact idea about many of the things you taught us that day. And there is no place where anyone can come to know all those details in one go. So you did a great job." 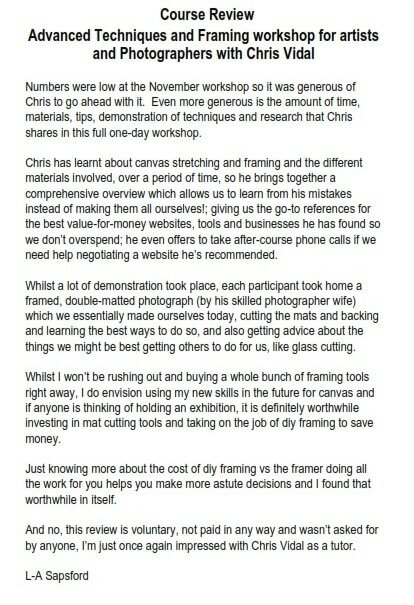 "...Your workshop last Sunday was excellent - very well planned & informative. Good notes, demonstrations on varnishing, framing etc were all very well presented & we both gained the knowledge we were needing. Thanks a lot for organising the day..."
"Hi Christopher. I really enjoyed the workshop. It was very informative and practical."